Home > New This Season! Each flameworked mini vessel is totally unique / pre-made with custom colors, ready to ship. These pendants come with a complimentary satin cord + FREE shipping worldwide. Functional artwork. Single handle design, with a round bottom. * These vessels work great as a personal - portable aromatherapy diffuser pendant. Ready to hold perfume, scented oils, or whatever you desire (each vessel comes with a cork). A fresh shipment of premium quality organic amber resins has arrived from India... enjoy! If you haven't experienced amber resin before, you're in for a real treat. It's a scentual blend of rare tree gums, powder & oils. It can be burned on a charcoal disk, worn as a (unisex) natural perfume, or used anywhere as an air freshener. For thousands of years incense has been a sacred element of worship. Commonly used in temples, ashrams, churches and mosques as well as in the home to purify and sweeten the atmosphere. 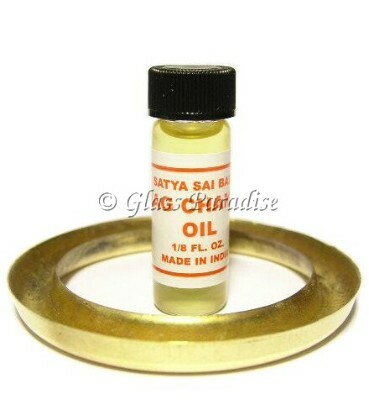 This fragrance is widely believed to elevate conciousness and open the heart chakara. Historically used as an aphrodesiac, Amber also promotes harmony & balance. 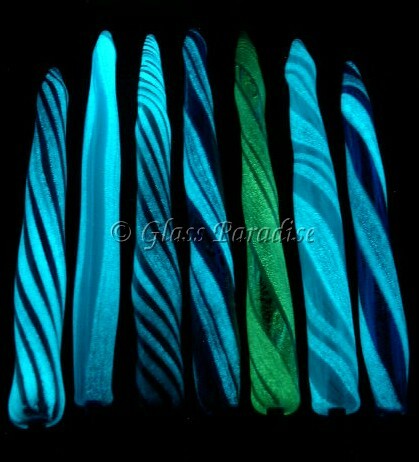 Introducing a hot new selection of art glass pens by Mark Black! We've always admired antique glass ink pens (used with an inkwell). However, most are purely ornamental, so we designed a contemporary ball point version which you can enjoy writing with everyday! *Easily refilled with a standard ball point ink cartridge. Borosilicate Pyrex pens are actually quite durable (think cookware). 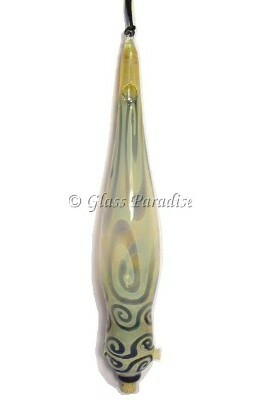 These one-of-a-kind hand blown glass pens are kiln-annealed / made to be enjoyed for many years. Glass pens warm to your touch (more so than with any other writing instrument). Once you've enjoyed the luxury of handling and writing with a Glass Paradise pen, other ballpoints will pale in comparison. 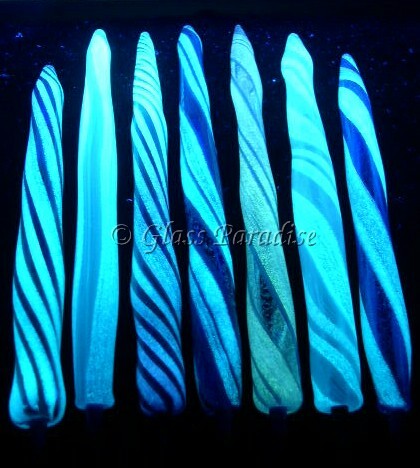 Made with durable Simax borosilicate glass and finely detailed with silver fumed encasements and phosphorescent stripes (which glow aqua blue / appear white under normal lighting). RSS stands for "Really Simple Syndication", and it is a tool that allows us to send you news and updates in real-time. Depending how you choose to set up your RSS reader, you can either see the entire RSS feed or just see the headlines. 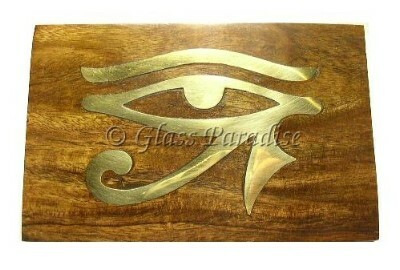 Headlines are linked directly to the appropriate webpage on Glass Paradise.com, so you can always read more. Glass Paradise - your premier source for hypoallergenic, reusable Pyrex drinking straws... proudly introduces "smoothie" straws (below) in four exciting new colors: cobalt, amethyst, citron, and emerald. Larger diameter straws for thicker drinks. 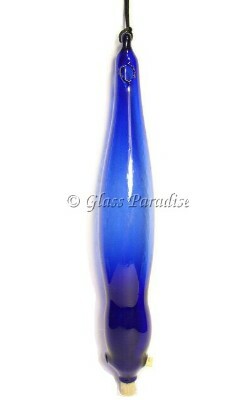 Visit our color changing glass incense burner category. Two new models added this month! Hanging incense burners keep glass out of harms way. Perfect for people with kids & pets around the house. Also great for handcrafters: add your own Macrame, hemp, or beadwork string to customize. 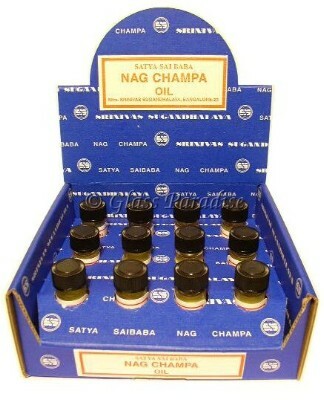 Update: as of 2007 Shrinivas Sugandhalaya (makers of the original Nag Champa) has discontinued their 3ml Nag Champa perfume oils, replacing them with 1/8 oz. vials. Besides updating the vessel design (the old ones had a narrow opening & ill-fitting cap) the quality of the oil has also been dramatically improved. As you'd expect from Shrinivas, it's extremely fragrant and perfectly suitable for wearing on your skin. Year after year this has always been a hot product (one of our top sellers) so we're sure all of our "regulars" are going to be delighted with these wonderful improvements. 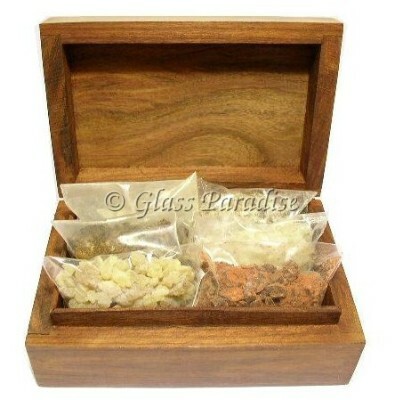 As many of you already know, Glass Paradise offers the world's finest selection of premium quality incense resins. Now we've assembled a variety of resin starter kits and gift packs. The newest addition to our product line: beautiful carved wood boxes, filled to the brim with a collection of our most popular resins! 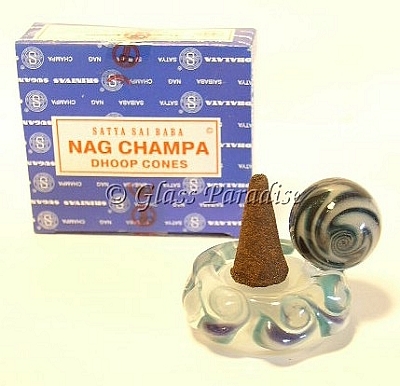 For the cone incense lovers, we've just added a fresh new batch of dhoop disks made with shimmering dichroic glass. Each one is totally unique, so be sure to check these out while supplies last. 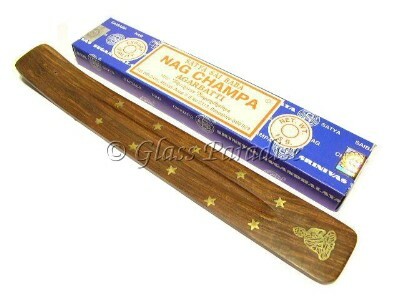 As always, each one comes with a complimentary 12 pack of the Original Satya Sai Baba Nag Champa incense cones. Our friend Chris Patyk has been at it again... combining flamework skills with coldworking techniques to achieve some truly amazing results! 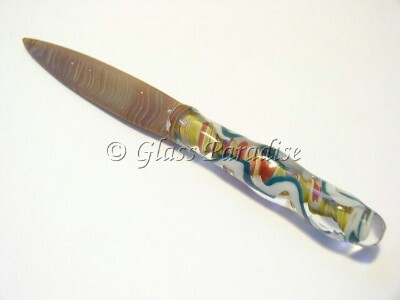 Visit our glass pens category to see his new letter openers. Exceptional Value: We've updated our selection of brass inlaid ash catchers, adding new "custom gift packs" enabling you to choose from a variety of cool new motifs & select your favorite Shrinivas incense sticks. Starting at just $2.25! Need a lamp ring diffuser? We've recently acquired a motherlode of these little brass gems and we're blowing them out at $1.00 ea! *(bundled with a $2.95 1/8 Fl. 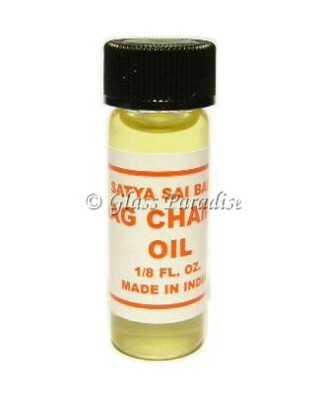 oz vial of Nag Champa sandalwood oil for a grand total of $3.95). Just pour some oil in the resivoir and set the brass ring on top of a vertical light bulb. Then, turn on the lamp & your fragrance oil will be vaporized by the heat of the bulb.